DALLAS — As Dwyane Wade walked to the scorer’s table in the first quarter, greeted by a mix of boos and cheers, Dallas Mavericks coach Rick Carlisle summoned Dirk Nowitzki to also check into the game for the first time. The two-time NBA Finals foes whose relationship used to be “frosty,” as Nowitzki puts it, stood next to each other and shared a laugh before entering the game together with 5:11 remaining in the first quarter. Nowitzki broke the ice by cracking a joke about Wade wrapping up his pregame warm-up by recreating the rebound and ball-throwing celebration from the last seconds of the Heat’s title-clinching victory in Game 6 of the 2006 NBA Finals on this floor. Wade’s final moments on the American Airlines Center court, where he has fond memories from 2006 and bitter memories from the Finals rematch with the Mavs five years later, were spent swapping jerseys with Nowitzki. Their rivalry grew icy after the Heat won the 2006 title, when Wade took offense to the Mavs’ implication that officiating decided the series and snapped back months later by declaring that Dallas would have won the series if Nowitzki had been the leader it needed. 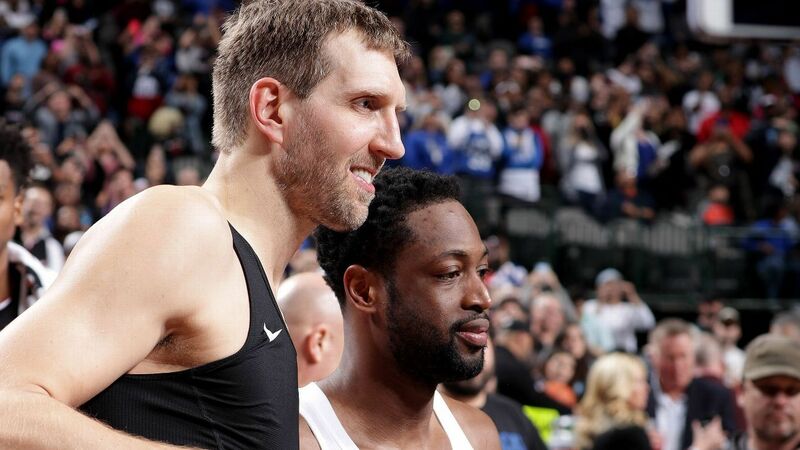 Wade added to the animosity when he, along with LeBron James, pretended to cough in front of cameras, mocking Nowitzki after he played with a 101-degree fever in the Mavs’ Game 4 win. But the hard feelings are water under the bridge, according to both future Hall of Famers. The jersey swap, a routine Wade is carrying out with opponents throughout the league during the retirement tour he has dubbed “One Last Dance,” provided proof of the mutual respect that has developed between the rivals. Nowitzki joked that he felt “naked” while wearing only his tank-top undershirt on his upper body during the first on-court jersey swap of his career. Nowitzki has gone to great lengths to avoid an official farewell tour — acknowledging that he is leaning toward retiring at the end of his 21st season but delaying the decision until the summer — but he was glad he played a role in Wade’s. “It’s a long time coming knowing that he’s been doing that,” said Nowitzki, who scored 12 points in 17 minutes on Wednesday. “I’ll cherish his jersey, obviously, knowing the great competition we’ve had for a long, long time. He’s a great, great player, one of the greatest guards we’ve had in our league. Wade was listed as questionable due to an illness after missing shootaround, but the 37-year-old admitted that Heat coach Erik Spoelstra basically just allowed him to stay at the hotel and get a little extra rest. Wade arrived at the American Airlines Center especially energetic, excited to play for his final game in an arena that was the site of extreme highs and lows in his career. “It’s one of those bittersweet kind of vibes,” Wade said. “I’ve obviously had a lot of great memories here and a lot of not great memories here, as well. Definitely bittersweet, but I enjoyed the environment tonight. There was a lot of support, a lot of fans, a lot of love, and I appreciate it. There were many Mavs fans with long memories who booed Wade, considered a villain in Dallas since 2006, every time he touched the ball. But there also were hundreds of fans wearing No. 3 Heat jerseys in the sellout crowd. They cheered loudly for Wade throughout the game and chanted, “We want Wade! We want Wade!” in the final minutes. “There’s a great karma to each one of them,” Spoelstra said. “They are both winners, but humble winners. They have tremendous class. And as soon as Dwyane got his opportunity to go one-on-one against him in the corner, you just knew that somehow Dirk was going to get him with an opportunity on the other end.